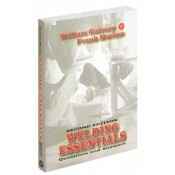 As a concise yet thorough introduction to the topic, this new edition of Welding Essentials makes welding easy for beginners and is a handy reference for professionals. Its unique, comprehensive question-and-answer format will allow readers to quickly find what they are looking for and fully understand it. Eliminating non-essential items to prevent overloading readers, Welding Essentials addresses safety hazards and required precautions in detail and provides solutions to common problems for each process. Additionally, this valuable reference carefully explains step-by-step setup and shutdown procedures, along with why equipment grounding and GFI's are needed and the way in which they work. • Welding tip sizes for differing metal thickness, as well as proper pressure settings for those tips and how to determine what the size is as related the non-standard numbering systems used by manufacturers. • New and improved drawings throughout. • Discussions on Carbon Arc Cutting with air, Plasma Arc Cutting, and Laser Cutting. • More thorough information related to the proper sizing of oxy-fuel cutting tips and pressure charts, and bore drill sizes for the various tips. • More thorough explanation of common welding elements. • New information on the wire feeding process and more in-depth information related to the use of the tungsten electrodes. • Friction stir welding process.